I think Macau has to be one of the most surprising places in the world that I have visited. Why might I say that? Well, it’s complicated, but it boils down to preconceived notions. 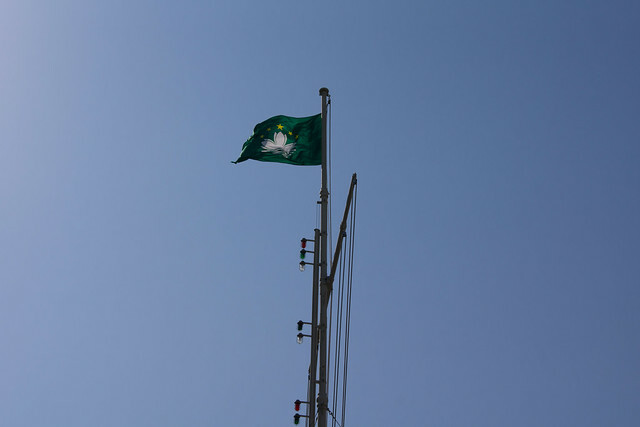 Let’s face it, there’s a lot of people in America who don’t even know that Macau is a Special Administrative Region (SAR) of China (or even exists), like Hong Kong, or that it was a Portuguese territory for almost 450 years (by comparison Hong Kong was only a British territory for a little over 150 years). 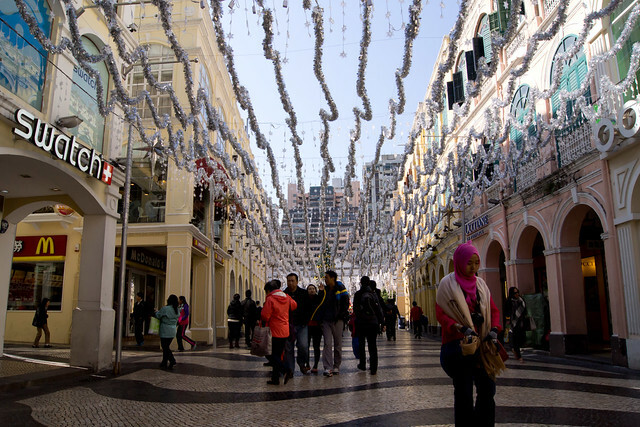 Portugal handed over Macau in 1999, and since then has transformed into the world’s largest gambling center, earning more than even Las Vegas. For those that know of Macau, I think this is the image that they get in their head – that it is nothing more than another Vegas in Asia with not much else. 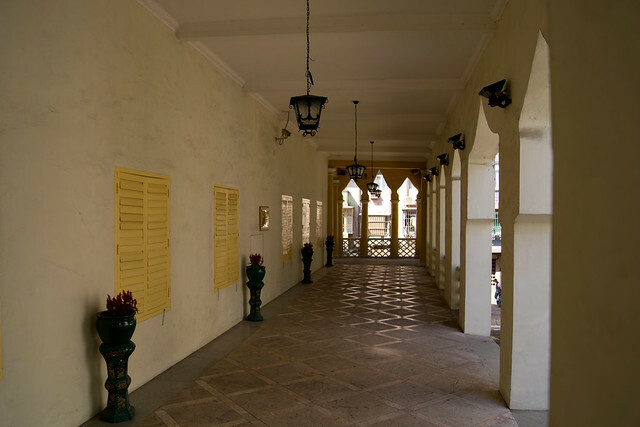 While, yes the casinos are a large part of it, there is so much history to explore in this city! 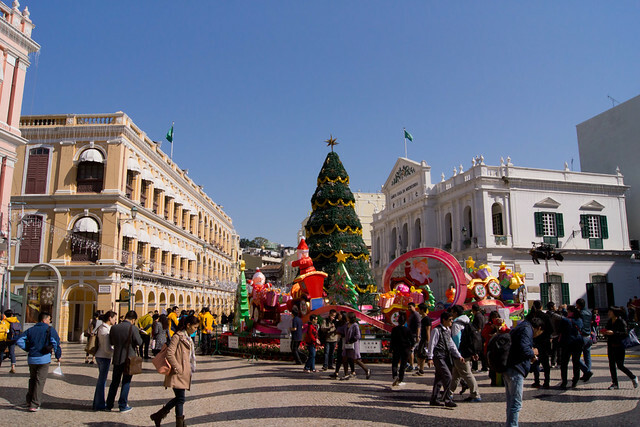 I think that most tourists that come over for a day from Hong Kong and see Casinos or maybe only a few sights get the wrong impression of Macau. While I won’t say that I got the full picture myself, I would like to think that after spending two nights here, that I got a pretty good feel for the city, it’s history and culture, all of which left me a bit surprised and wanting more! Does This Look Like China? I’m not going to lie, on that first night in Macau, I oriented myself through the massive Sands Cotai Strip and Venetian Macau complexes. Yes, I did not venture out in the city proper, but after going pretty hard in Hong Kong for the past few days I decided to take it a bit on the easy and slow side. Starting off with some drinks at the Lounge at the Conrad Macao, I then headed out to explore the two complexes and see if I could make a few extra Patacas on the side. Gambling is part of the reason that this territory exists, especially now that it is part of the PRC. As such, it’s worth just to check out the casinos if anything, because essentially they have outdone Vegas. The Venetian Macao for example, is the world’s largest casino, and is a good deal larger than the original in Vegas. Before you even hit the casino floor you realize how large it must be; as you walk to the Venetian from the Sands Cotai Central complex (which are right across the street from one another) it feels like a long hike as they guide you through the skybridge, a mall of luxury goods, what can only be described as an airport duty free shop, and more wrong turns than you can imagine because of poor signage. There’s the fake Venetian Canal shops as well, if that interests you, and of course the gaming area. The casino floor itself is massive. Had to be the largest one that I’ve stepped foot in, and it wasn’t even being fully utilized. there was a large area over by the night club that is in the casino area that was a void with no machines or tables. Definitely some room for them to expand, but I can’t even think how crazy that will be. 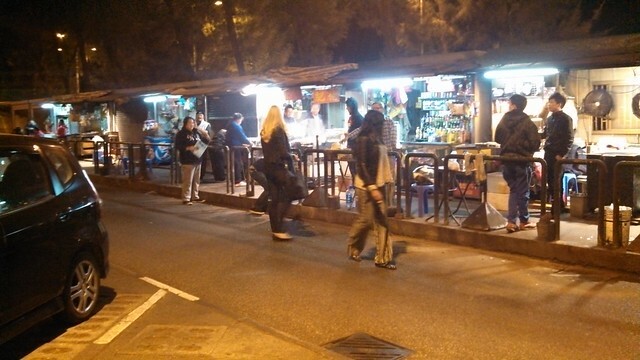 I visited here both my nights in Macau, hoping to win some Hong Kong Dollars to take back with me to HK (they don’t accept bets in the local currency – the Macanese Pataca for whatever reason). That first night, I stuck to things like slots and roulette and quite honestly, it wasn’t working out well for me and since that first night was about getting oriented, I probably spent as much time just wandering around the massive Casino. The second night however, I got a bit braver. I knew that baccarat was supposedly big over here, so I quickly watched a few videos in my hotel room before heading to the Venetian to get the rules of the game. There was potential there for me to at least have decent odds of not losing all of my hard earned cash, so I settled down at a low-bet table and started working at it. Giving my self a HK$1000 limit (somewhere around US$120) for this adventure, it started looking early on that this was going to be a disaster. There was a point where I was down to my last few HK$100 chips and I decided that I would go for the risk and bet on a tie. I only bet HK$100, but I wish I had bet more! My HK$100 bet turned into HK$1100 in an instant. Nothing could stop me, right? In fact that was a start of a good ride where at one point I had more than doubled my money. I mean I wasn’t the guy who was sitting next to me playing HK$10,000 chips and constantly winning, but I still was doing respectably well. I was at least smart when I saw the tides turning again and with about $1800 in chips decided to cash out, having nearly doubled my original investment. I figured this would at the very least get me a nice dinner or a bar tab back in HK. 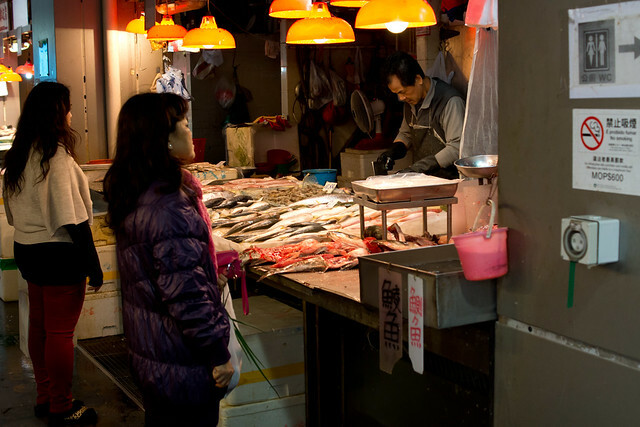 I came more to Macau to really explore the city and not really for the gambling aspect. I’ve got this weird thing about being interested in places like this that have interesting histories or are oddities on the map. 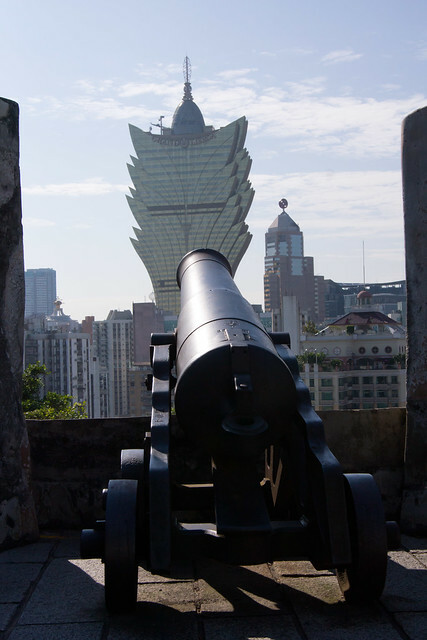 Unlike the day tourists that come over from Hong Kong, I wanted this to be a legitimate leg of my trip so that I could explore this city and see more than just a few tourist sights. 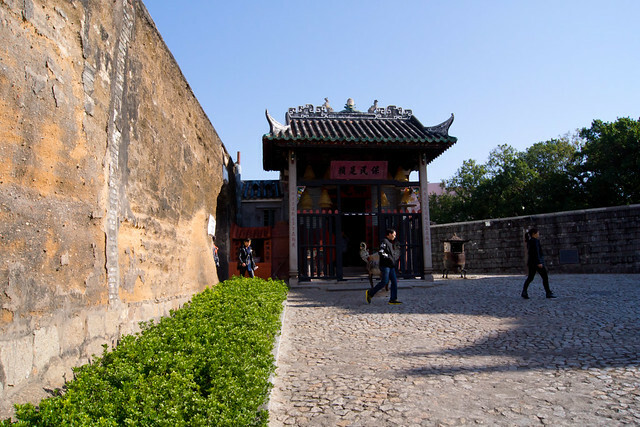 Given that I had one full day as part of my two night stay in Macau, I resolved to get started as early as possible, so that I could maximize my time while not feeling rushed. I figured that the easiest thing would be to take a taxi from my hotel to the Ruins of St. Paul and start wandering from there. It also meant that I would be guaranteed to be able to communicate with my taxi driver, by putting it in the hands of the hotel staff (one thing I read in advance of this trip was that very, very few people speak English or even Portuguese for that matter, which ultimately was actually true). It was a beautiful morning and day for my exploration and the cab ride into the historical center of town was nice with the windows on the cab down. As my cab got deeper into the city, the roads started to get a lot narrower and as we approached my destination more and more buses and people afoot. My driver didn’t seem to care if he was going to run over people in order to get me there, but eventually I decided I was close enough and had him let me out. 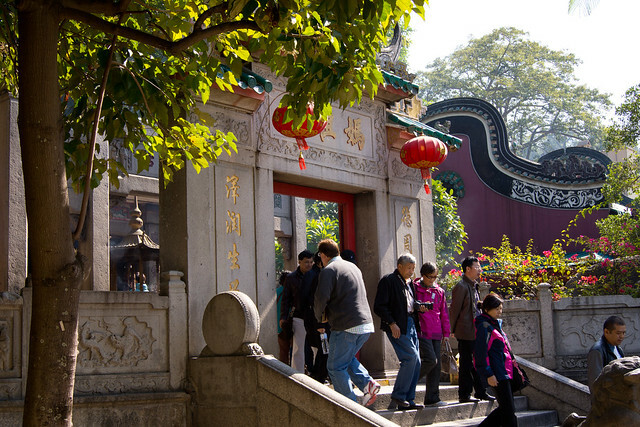 Being one of the major tourist sites in Macau, the crowds were quite numerous. 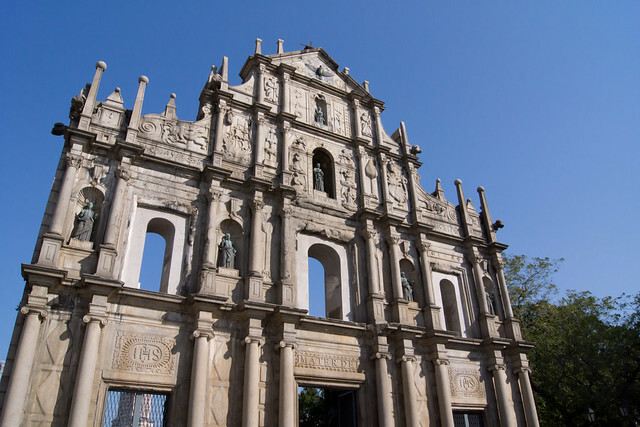 In what would seem to be the theme of my short stay in this city, I seemed to be the only westerner – Macau is big a tourism spot for people from mainland China, but the US? Not so much. The strange thing is that all the crowds seemed only to be at the ruins, the minute you went down the steps, around the corner or up into the Portuguese fort (Fortaleza do Monte) located just “next door.” Although they were all missing out; there were pretty good views from the fort and moderately quiet. From there I started my slightly aimless wandering. 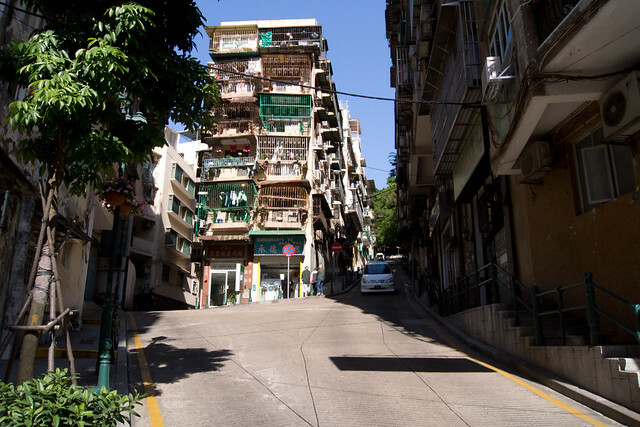 Down the hill I went walking along usually somewhat quiet or at least quieter side streets finding many of the historical buildings and sites within central Macau. 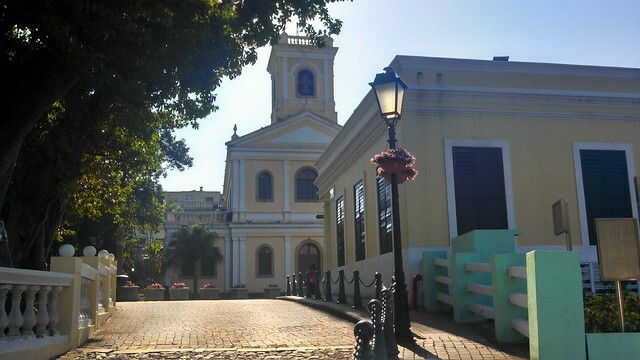 There was the Cathedral of Macau (Se Catedral), the Lou Kou Mansion, and the Largo do Senado by about mid-day. 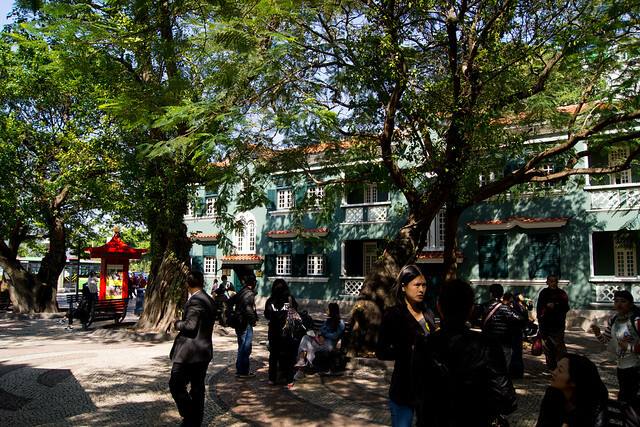 The Largo do Senado was quite crowded with what I can only assume were tourists, but it was worth checking out the large number of colonial buildings…and desperately trying to find a public restroom. Eventually, that search took me to a public market that is just off of the square and somewhat hidden – Mercado de S. Domingos. There wasn’t anything that was of interest to me, but if you want to see locals buying meats or vegetables, this would be somewhere to go. 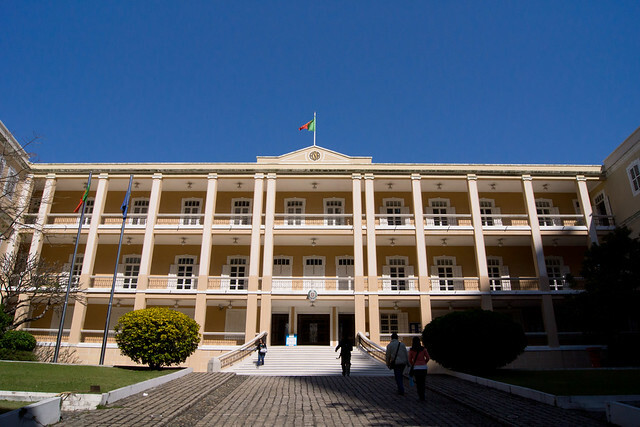 Also around Largo do Senado, you also have the main post office of Macau; from there I quickly sent myself a post card and got on my way again. 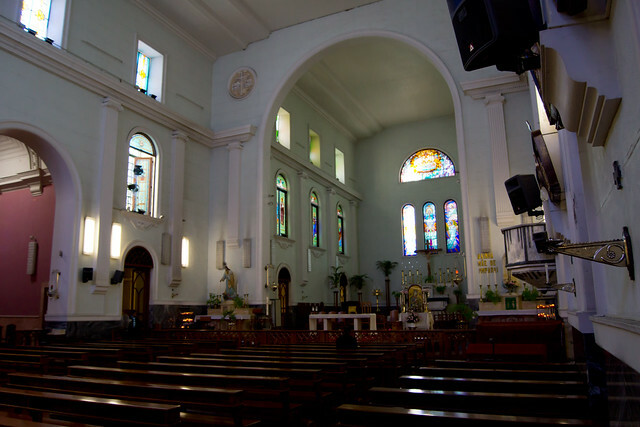 As I continued my exploration I found myself outside another church, St. Augustine Church, and then at the neighboring Dom Pedo V Theatre (built in the 1860s and considered one of the first western style theatres in China). I think one of the more surprising things I found as I wandered around, and part of what kept giving me the “this isn’t China” feeling, was when I stumbled onto Lilau Square. 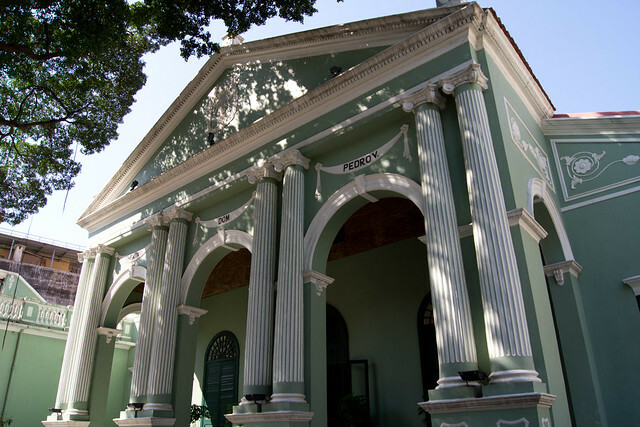 A small public square surrounded by old colonial houses and buildings, there were a few trees, a few locals relaxing and small kiosk store. While it’s not great people watching or even a fantastic view, I still found this as a nice little spot to take a quick rest. Not far from there is the Moorish Barracks, which I had figured would be a museum or something, but as I walked in the front door, it was clear that I was mistaken and this was not a tourist site…it was a Government building, and luckily they didn’t say anything as I turned around and left. 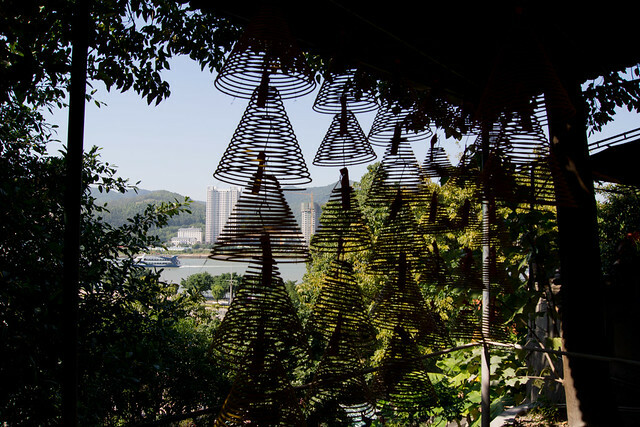 While my wanderings that morning had been relatively aimless, the ultimate goal was to get to the A-Ma Temple. Located right next to yet another public square, it seemed to be a good idea for checking out a local religious structure. Except it wasn’t entirely what I expected. A large portion was outdoors and built into the side of the hill it was next to. Unfortunately as I got to the upper level, I found some fellow Americans. These people, who were identifiable by the Georgia Tech School of Business jacket that one was wearing, had climbed on one of the large boulders that were adorned with text in Chinese in order to take a picture. Now, I don’t know if boulder had any particular religious significance, but I liken to not different as climbing around on the pews or alter in a Church. You just don’t do that. It’s disrespectful and it puts us Americans in a bad light. I’m guessing these were probably people on a day trip from Hong Kong and maybe they aren’t as culturally aware, but it still not an excuse for doing that. With that being said, the Temple did lend itself to being a great spot for my camera (no, I didn’t take any of me standing on a boulder or not). 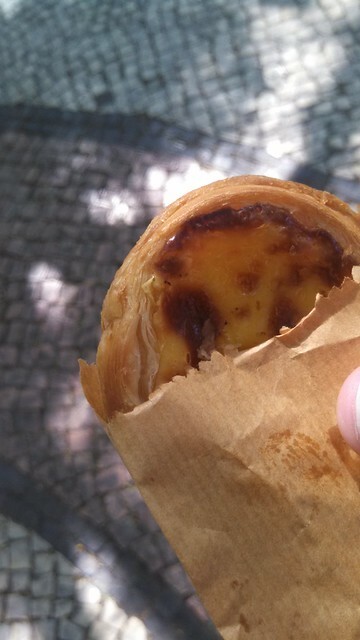 I thought about going to the Maritime Museum, but decided instead to grab myself a Egg Tart Pastry from an outlet of the Kol Kei Bakery nearby. A perfect little snack to keep me going before I figured out how to hail a cab. This was the part that I was somewhat worried about. 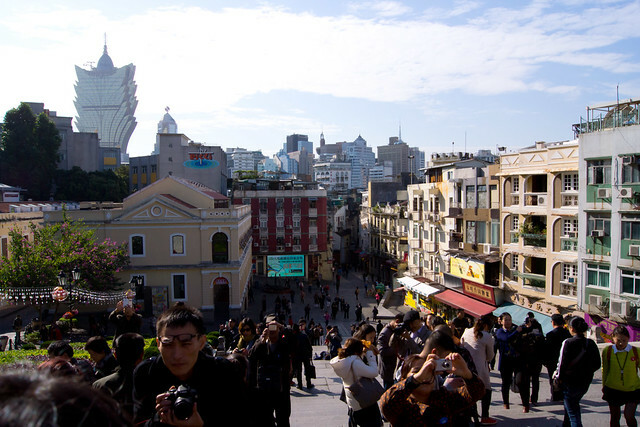 Before coming to Macau, I was told that I shouldn’t expect anyone outside of the hotels and potentially major tourist sites, as being able to speak English or even Portuguese for that matter. I knew that at some point I would need to take at least a cab or two from somewhere other than my hotel, so this was going to be a bit of a challenge. The other challenge was just trying to catch a cab. Despite being on a busy street, I tried for at least 15 minutes trying to flag a cab, and despite how many had passed me, I wasn’t having any success. I won’t speculate why that was, but eventually I was able to grab one as someone got dropped off…score! Using nothing but the guidebook my hotel gave me, I was able to get him to take me to my next stop the Fortaleza da Guia (Guia Fortress). 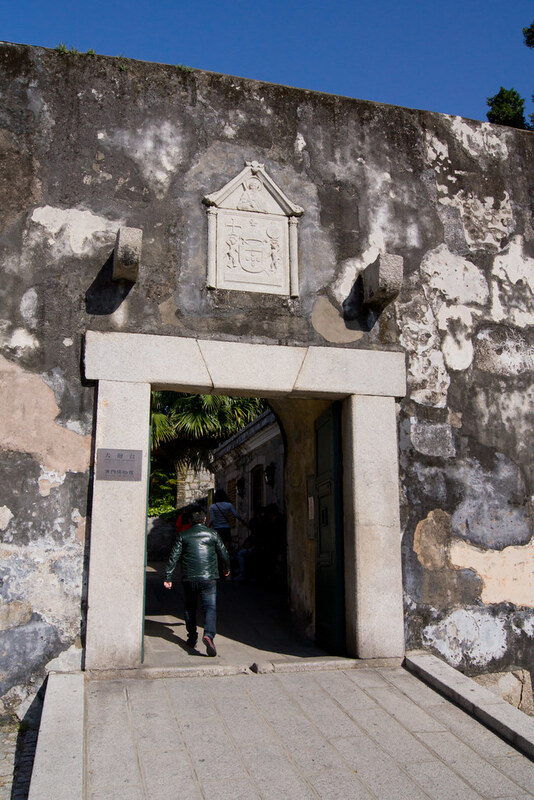 Located on a large hill, I noticed the fort’s lighthouse and chapel from the Fortaleza do Monte earlier in the day, and it is home to several great views of Macau. 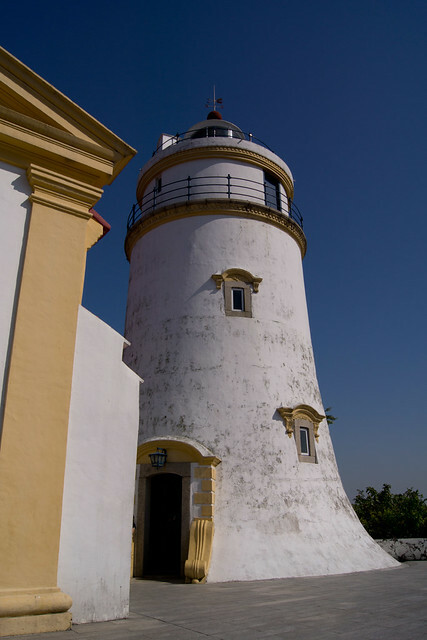 It also is where the first western-style lighthouse was erected in addition to having a small chapel present as well. After A quick look at those, I started down a path across the hilltop which took me past what looked like to be disused fortifications before finding myself at a cable car station. The ticket was pretty cheap and offered an alternative way back down to the rest of the city. 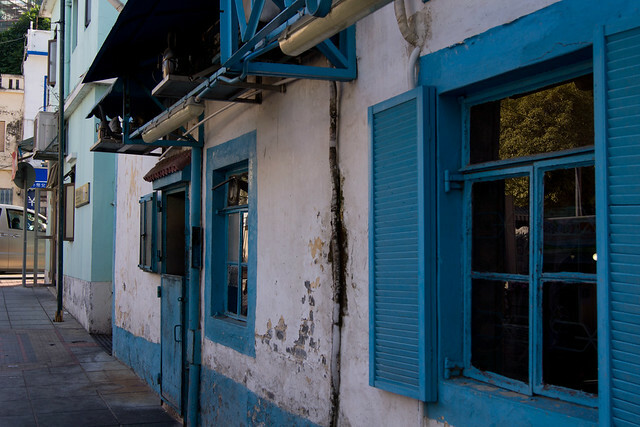 I knew I was starting to run out of steam, but figured I would make my way to Old Taipa Village. 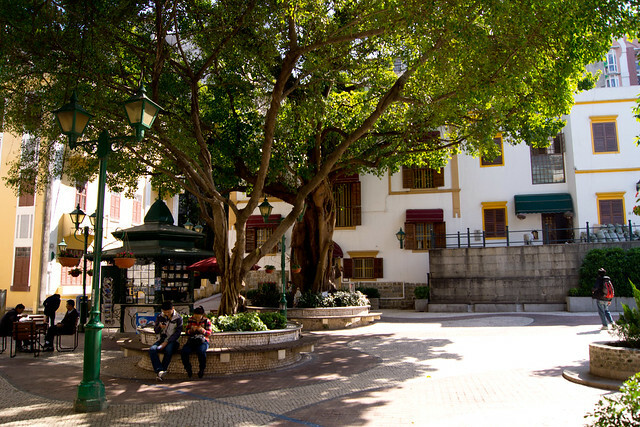 This area is considered one of the best preserved historical areas of Macau; just like the others, narrow streets, trees, and old buildings make up the majority of the area. 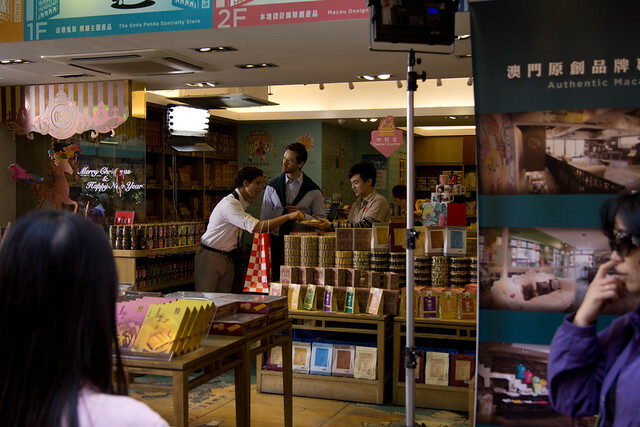 While there, I stumbled on some sort of film shoot (I’m placing bets on commercial) and tried Macao’s popular Pork Chop Bun. 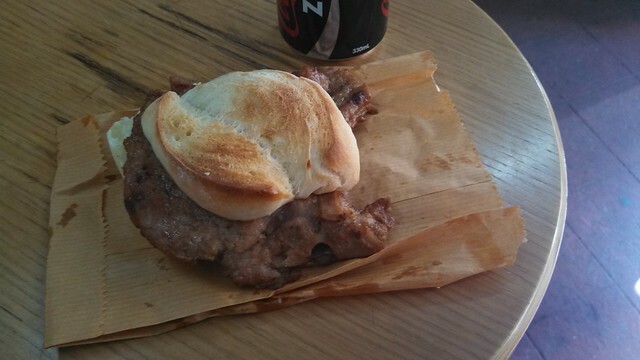 It’s exactly what it sounds like a fried pork chop sandwich; I went to Café Tai Lei Loi Kei in the area as some claim that it is the best or that they even invented it. For a mid-afternoon snack it was pretty good. 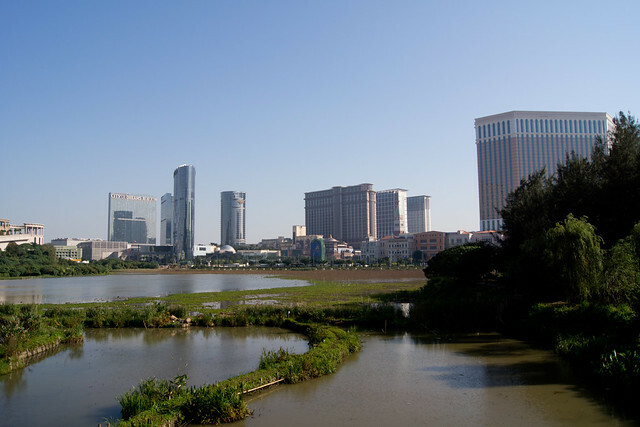 One thing to note is that Taipa Village used to be on the water; the Cotai strip where I was staying was built on reclaimed land that had previous been a body of water separating two islands in Macau. As such, when the Cotai strip went in, it lost its waterfront aside from a small lake next to the church that was formed from what was left. If you ignored the view of the casinos, and looked back at the church, you again had a sensation that it was not China that you were in. It was a good way to finish up my exploring of Macau before catching a cab to take me back the short distance to the Conrad. One of the things that I had wanted to do was go to a Portuguese restaurant while in Macau, having heard that there several good examples. I opted for Restaurante Fernando at pretty much the end of the territory on former Island of Coloane nearly on the southernmost part. I had the hotel call in advance since I had no idea what the hours were or if it would be busy and then had a taxi driver speed off into the night; going through quiet and mostly wooded parts of Macau – quite the opposite of “the mostly densely populated place in the world” that I had spent all day in. 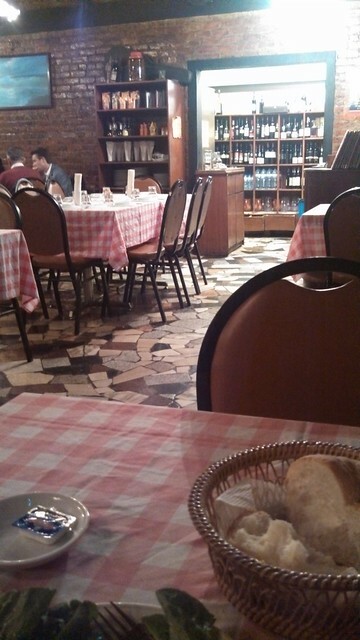 The restaurant I almost thought was closed when I arrived; I saw staff, but no one else. I was then shown through a hallway and past a courtyard, eventually to a dining room that had a fair number of people inside. I opted for Sangria to start, of which a nicely sized pitcher was brought to my table. I wasn’t really sure what to get, so I opted for some Portuguese Chorizo to start and then ordered the prawns. Since in Florida, most people will sell prawns/shrimp peeled and ready to eat, when I got then unpeeled, I had to think for a second about how to even peel one! It had been quite a while and I admit I am a little bit embarrassed by that! Once I had down though, it was all good. And the food and sangria were both excellent; I didn’t waste a drop or an ounce if that tells you anything. Getting back to the hotel was a little bit trickier. Being on the southern end of the territory and not heavily tourist-laden meant that Taxis were not exactly a dime a dozen. After I finished up I went outside and into the parking lot, which is shared with a public beach, and discovered this immediately. I probably should could have called the hotel, but instead I decided to walk around a bit in this quiet parking lot, checking out the beach, and wandering past the several food stalls that were set up that locals were there for. Eventually when a taxi did show up myself and two other people were vying for it. I asked if they would be find with splitting the cost of the ride, to which they agreed, and off we went. 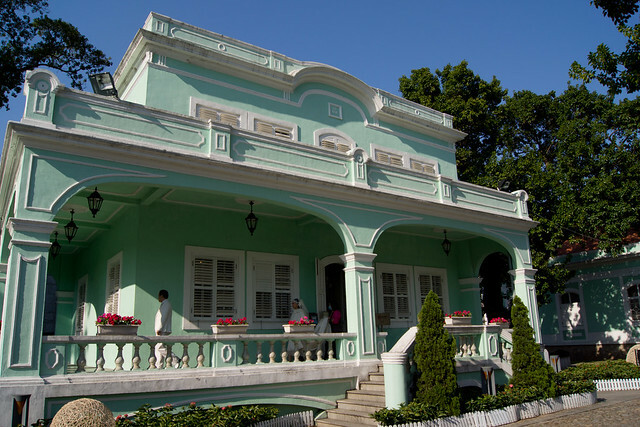 Unfortunately, the language barrier meant that we went past my hotel and went to theirs in Taipa first. 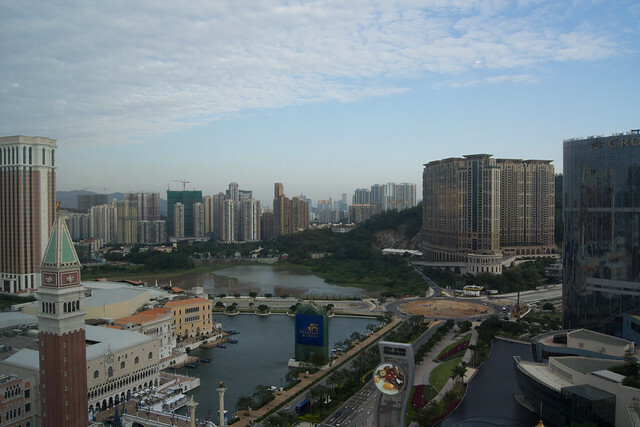 Once they gave me some cash, I had the driver turn back towards Cotai and the Conrad. Not terribly bad and accounting for their share I probably only paid slightly more than just the straight drive to my hotel. The next day, was going to be a little bit different. I planned to order room service for breakfast, as the Conrad gives to Hilton Diamond members the option of eating in the restaurant or taking the American Set Breakfast in their room. Other than just being able to get free room service, I wanted to eat in my room, as I planned to stay in my room all morning. Why you ask? Well, I could have checked out a little more of Macau, but at 9AM in the morning, Fox Sports Asia was simulcasting ESPN’s coverage of the UCF Knights (my alma mater) versus the USF Bulls – the restart of a college football rivalry game between two large universities barely 100 miles apart (if that), that also had the distinction of being a game that would either crown UCF as champions of the American Athletic Conference and an automatic BCS Bowl bid (our first ever opportunity to be considered), or end those aspirations. Plus I had talked a lot of smack to the USF alum that sits in the cubicle next to me prior, so I had a vested interest in watching this game to make sure it went well. Besides, I was in this amazing suite anyways, especially considering that I had never had any hotel room that featured a separate media room with surround sound, so after my breakfast was delivered (which was pretty decent) and chowed down on while watching a replay game that was airing before, I bunkered down in the media room for a morning of sitting on the edge of my seat. Despite the fact that UCF was winning games this season, including against some very tough opponents, each game nearly gave fans heart attacks; multiple times. In fact at one point it was bad enough that I reached into the minibar in my room to grab a beer (which by the way, for once, was actually not horrendously overpriced – I think it was US$4.50 for a Heineken). 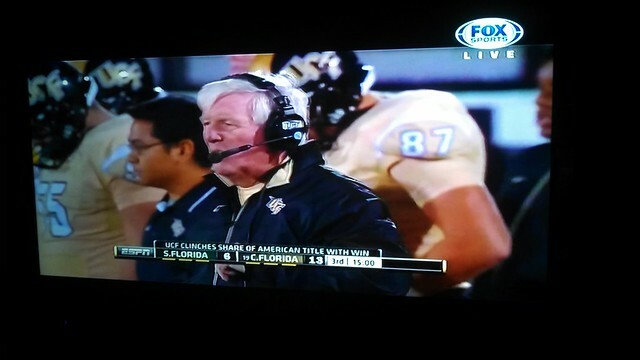 But in the end my Knights won and put us on the path to going to the Fiesta Bowl. 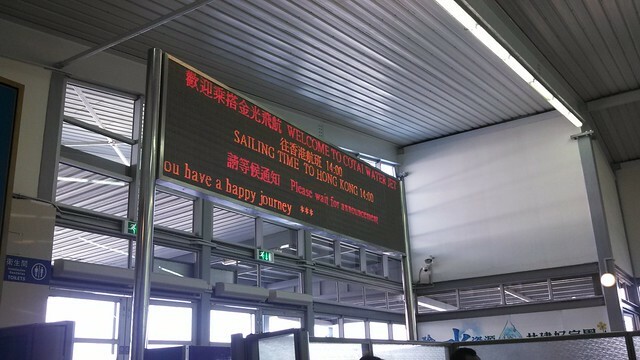 This entry was posted in Hong Kong and Macau, Macau, Travel, Trip Report. Bookmark the permalink. Follow any comments here with the RSS feed for this post. Post a comment or leave a trackback: Trackback URL.